James Gordon Brown, born 20 February 1951 in Kirkcaldy, Scotland is a British Labour Party politician, who has been a Member of Parliament (MP) since 1983, currently for Kirkcaldy and Cowdenbeath. He served as the Prime Minister of the United Kingdom and Leader of the Labour Party from 2007 until 2010. Brown became Prime Minister in June 2007, after the resignation of Tony Blair and three days after becoming leader of the governing Labour Party. Immediately before this, he had served as Chancellor of the Exchequer in the Labour Government from 1997 to 2007. His tenure ended in May 2010, when he resigned as Prime Minister and Leader of the Labour Party. Born in Kirkcaldy, Scotland, on February 20, 1951, to the Reverend John and J. Elizabeth Brown, Gordon Brown exhibited a gifted capacity for academics and athletics from an early age. Due to his athletic acumen, Brown suffered an injury as a teenager while playing rugby that resulted in a complete loss of vision in one of his eyes and a persisting irregularity in the movement of his facial muscles. After his placement in an accelerated educational program, Brown attended the University of Edinburg, entering at only age sixteen, where he showed an interest in politics through his engagement in various extracurricular activities, including the school's Labour club. After a brief editorial career in television news, Brown ascended in Labour Party politics eventually becoming chair of the Scottish Labour Party, of which his father had also been a member, and winning a seat in the House of Commons in 1983. As the Labour Party's opposition, the Conservative or Tory Party, maintained power through 1997 with Margaret Thatcher followed by John Major as its leader and Prime Minister of Great Britain, Brown worked alongside Tony Blair as an Opposition Trade and Industry Secretary and Shadow Treasury Chancellor earning a reputation as an authority in economics and finance. With Blair's success in winning both leadership of the Labour Party and the role of British Prime Minister in 1997, Brown was accorded a position as chancellor of the exchequer within Blair's cabinet. With "the two sharing a rivalry that became the defining dynamic of the Labour government," as Jonathan Freedland reported in an article titled "Who is Gordon Brown?" for the New York Review of Books, Brown became "the longest-surviving and most dominant chancellor in British history." However, during his time as chancellor, Brown received some criticism for his conservative economic policies, such as his opposition to Britain's adoption of a single European currency, which despite his contributions to the government's emergent budget surplus seemed in opposition to his party's agenda. While Blair was enthusiastically cast as a charismatic leader, Brown was recurrently depicted by news media as dower and impersonal. Nevertheless, in 2007, following Blair's resignation, Brown became Prime Minister of Great Britain. After his election to that post, Brown enacted several significant changes affecting the British economy, namely interest rate reforms, extended Treasury powers, and tax cuts. Moreover, his fiscal shift towards increased government spending allowed for funds to be redistributed to social programs such as education and healthcare directed towards serving Britain's underprivileged segments. However, this change has drawn equal measures of criticism and support. For instance, Douglas Davis, a World Politics Review contributor, described a less than favorable view of Britain's shift in government spending and stated, "Brown himself indulged in an unprecedented borrowing spree to fund substantial increases in public spending" resulting in an enduring struggle for the economy, while Paul Taylor, in an essay for the International Herald Tribune, noted Brown's receipt of "international admiration as the savior of the global banking system and [as] an apostle of cross-border financial supervision." In addition to his ambiguously perceived success in financial policy and unprecedented efforts towards bipartisanship, Brown faced a number of challenges during his initial tenure as Prime Minister, including threats of domestic terrorism, Great Britain's continued involvement in international conflicts, and negative twenty-first century trends in world credit markets. In response to the latter, Brown stated, "The greatest of global challenges demands of us the boldest of global cooperation," in his article titled "Out of the Ashes" for the Washington Post. Brown also advocated a rebuilding of what he called the "fractured international financial system" in which leaders should "seek a world trade agreement and reject the beggar-thy-neighbor protectionism that has been a feature of past crises." Brown's article for the Washington Post is just one brief example of his degree of comfort in engaging in political and economic dialogues in print. Throughout his career Brown has continuously found time to publish works detailing matters of political interest. Brown's book publications include: The Red Paper on Scotland, A Voter's Guide to the Scottish Assembly and Why You Should Support It, The Politics of Nationalism and Devolution, Scotland, the Real Divide: Poverty and Deprivation in Scotland, Maxton, Where There Is Greed: Margaret Thatcher and the Betrayal of Britain's Future, John Smith: Life and Soul of the Party, Values, Visions, and Voices: An Anthology of Socialism, New Scotland, New Britain, Global Europe: Full-Employment Europe, and Stronger Together: The 21st Century Case for Scotland and Britain. Brown's body of published work delivers the framework of his political ideology and views regarding the evolution of the Labour Party, the British political process, and the future of modern British politics in a global society. He also brings a historical perspective to subjects such as class divide and social inequality as well as civic rights and responsibilities. Brown, as he demonstrates in his works, recognizes the need for bureaucratic change in reaction to a changing populace and acknowledges issues, such as the global market economy and immigration, which are modern phenomena that are not merely confined to the domestic arena. In particular, Values, Visions, and Voices provides Brown's interpretation of British socialism through a compilation of scholarly essays detailing the movement as a social rather than economic paradigm. Devoid of radicalism and infused with moral integrity, the text's brand of socialism makes the ideology seem singularly British. In 2007, the same year in which he was elected Prime Minister, Brown released Courage: Eight Portraits, an exploration of courageous acts and notable figures of the twentieth century. Brown began work on the text after the death of his daughter, Jennifer, in 2002, and he arranged for the book's proceeds to be donated to a charity for research on infant mortality. According to John Kampfner's review for Newsweek International, the text reveals Brown's fascination with heroism and the individuals who influence his politics. Additionally, Clive Stafford Smith, in a contribution to the New Statesman, claimed that Courage is analogous to "Profiles in Courage, the 1956 history of eight American senators that won John F. Kennedy a Pulitzer Prize and established him as a serious presidential candidate," and observed that Brown divides those exhibiting the heroic characteristic into three types, "career heroes," "situational heroes," and "sustained altruists." Smith found "telling" that all of Brown's subjects are gleaned from the latter heroic subtype and that "many of his examples sacrificed their lives by acting on their beliefs." Of Brown's vignettes, the portrait of Kennedy is perhaps the most disjointed, for he is the only subject not to have been threatened with death by a governing body as a consequence of his moralistic actions. Smith stated that Brown's selection of Kennedy as a subject for heroic scrutiny "is a strange one" but acknowledged that Brown's subjects, including Kennedy, "are all ultimately non-violent, focused on reconciliation rather than revenge." Brown explores, through these individuals, the facets which make for a courageous character and the implications of having such a nature. In an essay for Spectator, Matthew D'Ancona found that "what makes the chancellor's exploration of courage so intriguing and the book so readable is its intensely personal character. This is not another tedious campaign memoir or book-as-manifesto. It is, instead, an unexpectedly candid act of moral self-examination and deliberation." Brown avoids a pretentious tone, as D'Ancona wrote, by crafting a narrative tone which "is confessional rather than homiletic." In focusing on the ideals that a modern audience could extract from past examples, Brown draws a connection between these extraordinary individuals and illustrates how a contemporary person could, and should, emulate these qualities. Freedland claimed that "no British Prime Minister since Churchill has written anything quite as good" as Courage, and he suggested that "there are nine portraits in this book and the ninth is Gordon Brown himself. His own preoccupations-among them, duty and the call of public service-are visible on every page." Born February 20, 1951, in Kirkcaldy, Scotland; son of John (a minister) and J. Elizabeth Brown; married Sarah Jane Macauley, August 3, 2000; children: Jennifer Jane, John, James Fraser. Education: University of Edinburgh, M.A., 1972, Ph.D., 1982. Politics: Labour Party. Addresses: Office: 10 Downing St., London SW1A 2AA, England. Writer and politician. University of Edinburgh, rector, 1972-75, lecturer after 1976; Glasgow College of Technology, lecturer, 1976-80; Scottish Television, current affairs editor, 1980-83; British House of Commons, first elected in 1983; British Labour Party, chair of Scottish Council, 1983-84, opposition chief secretary at the Treasury, 1987-89, opposition trade and industry secretary, 1989-92, shadow Treasury chancellor, 1992-97, chancellor of the exchequer, 1997-2007, party chair, May, 2007-10; Prime Minister, June, 2007-10. * The Red Paper on Scotland, EUSPB (Edinburgh, Scotland), 1975. * A Voter's Guide to the Scottish Assembly and Why You Should Support It, Studioscope (Edinburgh, Scotland), 1979. * The Politics of Nationalism and Devolution, Longman (New York, NY), 1980. * Scotland, the Real Divide: Poverty and Deprivation in Scotland, Mainstream (Edinburgh, Scotland), 1983. * Maxton, Mainstream (Edinburgh, Scotland), 1986, reprinted, 2002. * Where There Is Greed: Margaret Thatcher and the Betrayal of Britain's Future, Mainstream (Edinburgh, Scotland), 1989. * John Smith: Life and Soul of the Party, Mainstream (Edinburgh, Scotland), 1994. * (Editor, with Tony Wright) Values, Visions, and Voices: An Anthology of Socialism, Mainstream (Edinburgh, Scotland), 1995. * New Scotland, New Britain, Smith Institute (London, England), 1999. * Civic Society in Modern Britain, Smith Institute (Amersham, England), 2001. * Maxton, Mainstream (Edinburgh, Scotland), 2002. * Global Europe: Full-Employment Europe, HMSO (Norwich, England), 2005. * Stronger Together: The 21st Century Case for Scotland and Britain, Fabian Society (London, England), 2006. * Courage: Eight Portraits, Bloomsbury (New York, NY), 2007. * Britain's Everyday Heroes: The Making of the Good Society, Mainstream (Edinburgh, Scotland), 2007. 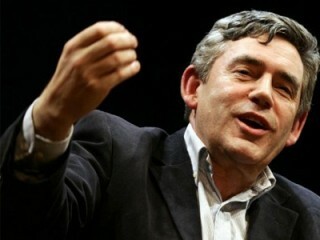 View the full website biography of Gordon Brown.